Months after boasting that he would replace existing President Muhammadu Buhari in 2019, Ekiti State Governor, Ayo Fayose, yesterday flagged off his presidential campaign on social media. The chairman of PDP Governors Forum, however, did not state on which political platform he planned to pursue his presidential ambition. But observers believe Fayose may just be positioning himself for the vice presidential ticket. Last week, the party, in the wake of the epoch apex court ruling that rescued it from its protracted leadership crisis, restated its commitment to adhere to the existing zoning that ceded the plum job to the north and the vice presidential office to the south in 2019. 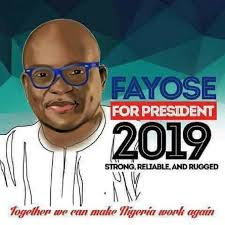 Fayose had, on several occasions in the recent past, declared he would kick the All Progressives Party (APC)-led Federal Government out of office in 2019. “I have a penchant for taking powers; that one in Buhari’s hand, I will take. I’m going straight to that Villa. I’m the next president. I want to be the next president of Nigeria. My own won’t be this change that has brought nothing; we are going to represent the people well and tell them the truth,” he said. The governor had initially said he would approach the Supreme Court to determine his eligibility to contest for the state governorship election in 2018 to enable him to complete his first term in office, following court’s ruling quashing his impeachment. But the Publicity Secretary of the APC, Taiwo Olatunbosun, dismissed Fayose’s presidential ambition as a pipe dream.